For other people with the same name, see Robert Farrell. Roberto Alfonso Farrell (6 October 1949 – 30 December 2010), known professionally as Bobby Farrell, was a Dutch dancer and performing artist from Aruba, best known as the male member of the successful 1970s pop and disco group Boney M.
2 Years with Boney M.
Farrell was born and raised on the island of Aruba in the Curaçao and Dependencies (later Netherlands Antilles). He left after finishing school at 15 and was a sailor for two years before moving to Norway. He then went to the Netherlands, where he found occasional work as a DJ before finding better opportunities in Germany. In Germany, he worked mostly as a DJ until producer Frank Farian spotted him for his new Boney M. group. He became the sole male singer in the group, although Farian later revealed that Bobby made almost no vocal contributions to the group's records, with Farian himself performing the male parts on the songs in the studio. Liz Mitchell claimed that only she, Marcia Barrett and Farian had sung on the hit recordings. Farrell did, however, perform live in some of the various incarnations of 'Boney M', including the main 1970s incarnation. Farrell left the group in 1981, after clashes with Farian. He was replaced by Reggie Tsiboe. He re-joined in 1984, and continued as a member until it finally split in 1986. Farrell's daughter Zanillya Farrell claims that Farian deprived Farrell of his rights over Boney M.'s hits, which caused her father to lose all his income after the band split. When Dad asked Farian for 100,000 marks he was told to sign some papers. He signed away everything – image rights, royalties, the lot. My father lost everything. We had to move in with my grandmother in the Netherlands and live on welfare. After that, Dad started getting angry a lot. But Mum was very smart and realised if you own the name you can use it. Farian had not registered Boney M all over the world. So that’s why Dad could perform in certain countries. He subsequently toured with his own group performing the band's hits under the name "Bobby Farrell's Boney M.". He also appeared as a dancer in late 2005 in the Roger Sanchez video clip of Turn on the Music. Farrell lived for many years in Amsterdam, in the neighbourhood of Gaasperdam in the borough of Amsterdam-Zuidoost. In 1981 he married Macedonian Romani Jasmine Shaban. They had daughter Zanillya Farrell in 1983 and son Zanin. They split in 1995. He died on the morning of 30 December 2010, in a hotel in Saint Petersburg, of heart failure. His agent John Seine said Farrell was complaining of breathing problems after performing with his band the evening before. Farrell's body was reportedly discovered by hotel staff after he failed to respond to an alarm call. He was buried at Zorgvlied cemetery. Very soon after his death was reported, it was observed to have occurred on the anniversary of, and in the same city as, the death of Rasputin, described in Boney M's eponymous hit single, in a case of life imitating art; Farrell had also dressed up as Rasputin in some band performances of the song. His daughter Zanillya Farrell is a rapper. In December 2011, she won the national music prize Grote Prijs van Nederland in the hip hop category. 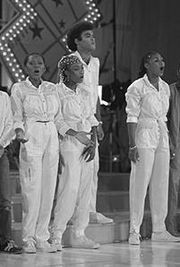 Farrell, 3rd from the left, performing with Boney M. in 1981. All of these releases contain re-recordings of Boney M.'s hits - not the original versions. ^ Wainwright, Martin (30 December 2010). "Boney M singer Bobby Farrell dies at 61". The Guardian. London. Retrieved 30 December 2010. ^ "Whatever happened to Boney M?". BBC News. 29 January 2002. Retrieved 30 December 2010. ^ Larkin, Colin (2006). The encyclopedia of popular music: Morricone, Ennio - Rich kids, Volume 6. Oxford University Press. p. 745. ISBN 978-0-19-531373-4. ^ "Farrell overleed door hartfalen". De Telegraaf. 31 December 2010. Retrieved 1 January 2011. ^ "Boney M singer Bobby Farrell dies aged 61". BBC News. 30 December 2010. Retrieved 2010-12-31. ^ Ben Todd and Georgina Littlejohn (30 December 2010). "Boney M's Bobby Farrell dies on the same day and in the same town as Rasputin... the subject of one of the band's biggest hits". Daily Mail. Retrieved 30 December 2013. This page was last edited on 20 February 2019, at 19:36 (UTC).